We spent the first evening in Corse island on the Fautea beach. The beach is protected by rocky outcrops on both sides. The old lighthouse is located on one of them, so we occupied second one to have a chance incorporating the lighthouse into compositions. We spent almost whole late afternoon on this location by scouting the best compositions. and hoping for beautiful sunset. During the evening the storm came from inland and heavy clouds followed each other. I’ve used line of clouds to create contrast between sunset’s alpenglow and incoming storm. Also clouds arranged into diagonal line delivered dynamics into image. The whole dynamics is also underlined by the second exposure targeting sea waves to create contrast between calm sea waves and stormy sky. 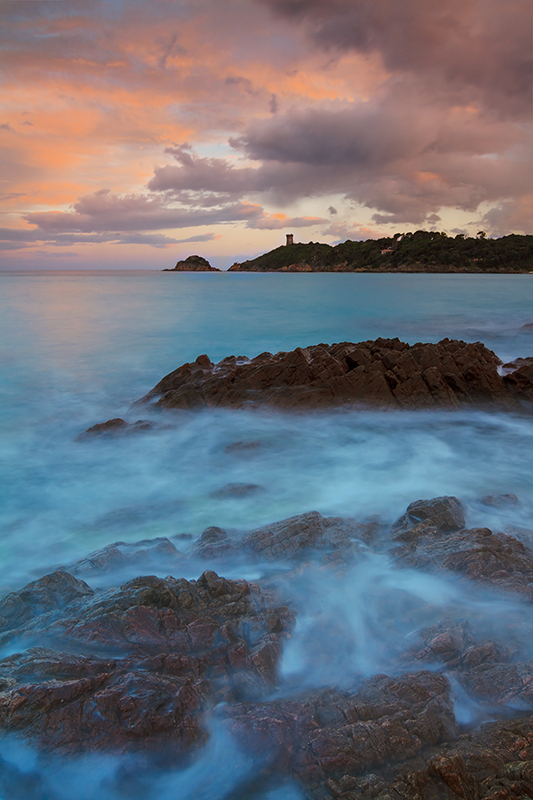 The seascape image is available for sale on 500pxart. The landscape image consisted from two exposures as it was described above. Each exposure has been processed differently, the first one focusing on sky to reveal more details, while the second one targeting softening sea by longer exposure. After that I used luminosity masks to enhance alpenglow colors, reveal details on lighthous’ rocky outcrop and to merge exposures together.